Eating a healthy salad is a surefire way to make you feel better about yourself. Not only is it physically good for you, but it’s psychologically beneficial as well. 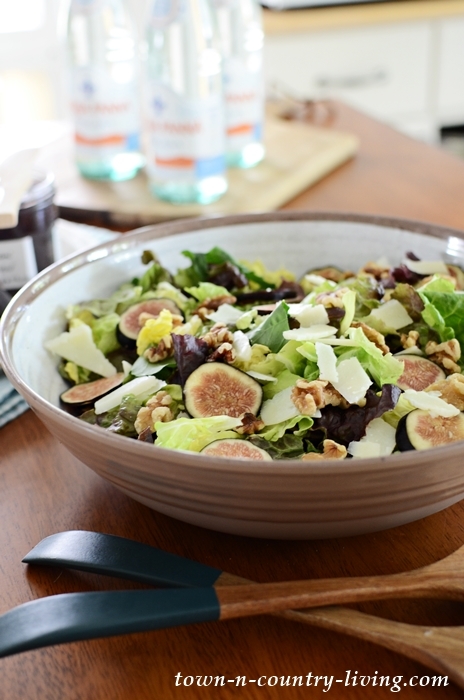 Today’s Fig and Walnut Salad provides oodles of nutritional benefits. Red and green leaf lettuce pairs together to create the base for this tasty salad. 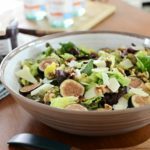 Add figs for sweetness, walnuts for protein, and cheese for flavor – and you have a salad that’s perfect for lunch or dinner. 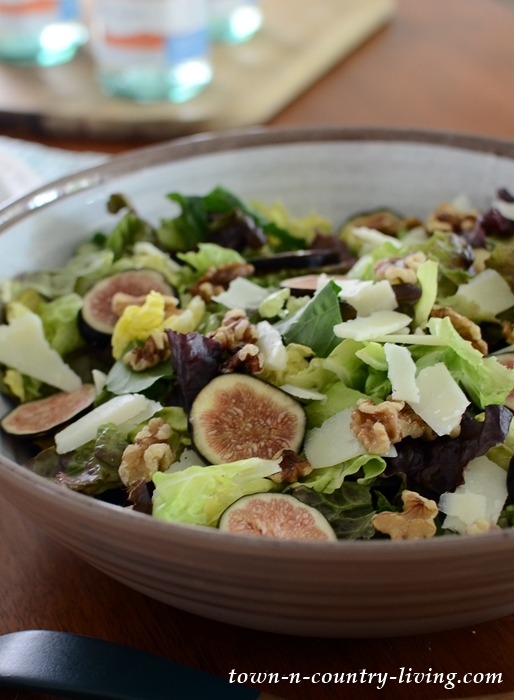 You might remember seeing pictures of this fig and walnut salad in my cozy summer kitchen post last weekend. 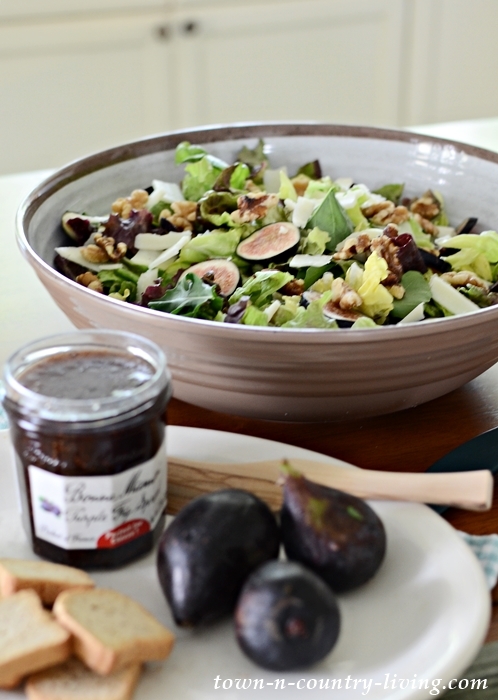 It has a balsamic and red wine vinaigrette dressing that adds a great balance to the figs and cheese. You’ll find numerous health-boosting ingredients in this mission fig and walnut salad. Figs are high in fiber, vitamins, minerals (including calcium) and omega fatty acids (the good fat). They’re extremely beneficial to your digestive system due to their high fiber content. Walnuts carry the most antioxidants of any nut and also promote a healthy gut. And like figs, they’re also high in omega-3s. Green Leaf Lettuce is super high in Vitamin K and contains beta-carotene for healthy eyesight. Red Leaf Lettuce also contains Vitamins A and K, making it a great choice for vision and good skin. Arugula is also high in Vitamin K and other minerals and vitamins; it provides anti-inflammatory benefits in addition to being packed with antioxidants. Give this healthy salad a try. You’ll feel better about doing something good for your health and body! Combine the vinegars, oil, and 1/8 teaspoon salt. Whisk together and set aside. Mix the greens together with half the dressing. Taste the salad and add more dressing, if desired. Toss the figs and walnuts into the salad. Sprinkle cheese shavings on top and serve. This is a great salad and love fresh mission figs. Too bad the season is so short. Sounds wonderful. Yet another of your suggestions to try. I have never eaten a fig on salad but, do like salad and it sounds good for me so i am ready to give it a try. Thanks.